With the world entering a new geological epoch – the Anthropocene – the idea that we now live in a very different world than the one our not-so-distant ancestors inhabited, has never been truer. But amidst global deforestation, melting ice sheets, and general biosphere degradation, perhaps the human microbiome – the collection of our microbiota and their genes – was an early, yet unrecognized, casualty. As a microbial canary in the coalmine, the modern human microbiome starts looking like a cog in the wheel of current ecological disasters when considered against the backdrop of our recent work among East African hunter-gatherers. In the faint glow of the firelight, I watch as a Hadza hunter skillfully butchers a baboon and shares meat with others around the fire. Nothing goes to waste as organ meats, including the brain, are consumed along with raw colon and stomach that are eaten sushi style. By sterile western standards it’s a gruesome sight for an evening meal. No matter how many times I’ve watched Hadza carve up a myriad of animals dispatched with bow and arrow, I am still taken back by the extraordinary exchange of microbes between the Hadza and their environment – a microbial tango that likely characterized the entirety of human evolution. Breathless news coverage on the connection between ones gut microbes and some ailment of the modern world is a near weekly occurrence. Though causality is illusive, research is connecting microbes to conditions as diverse as obesity, diabetes, autoimmune diseases, heart disease, IBS, chronic fatigue syndrome, autism, food allergies, neurological and psychiatric disorders and the list goes on – and will surely grow. An emerging trend in this research is that microbial diversity is diminished during many of theses disease states and that a drop in ones diversity can often signal the onset of a disorder. The rub is, of course, did the disease cause the drop in microbial diversity or did the drop in diversity precede the disease? While these are early days and much work lays ahead, the idea that microbes and the diversity of microbes we carry may help us better understand and head-off disease in the twenty-first century has spawned a level of optimism in medical research not seen since the humanity-altering introduction of antibiotics over 50 years ago. Seems everyone from the White House to Wall Street is paying attention. Which brings me back to the Hadza. Living and working amongst the Hadza for years has brought front and center the intimate relationship humans have likely evolved with diverse groups of microbes. With each animal killed, microbes are given the opportunity to move from one species to the next – so long as they can find a suitable niche. With each berry that is plucked from a bush or tuber dug from beneath the microbial-rich ground, each and every act of foraging keeps the Hadza connected to an extensive regional (microbial) species pool. From high in the mighty baobab tree, where Hadza climb to gather natures most energy dense food – provided by African honey bees – to the pools of drinking water dotting the landscape to the feathers from a bird felled by a Hadza arrow, each touch point on the landscape is linked in a microbial network that runs through the gut of every Hadza. My colleagues and I have collected thousands of stool, skin, oral and environmental samples of all kinds, ranging from water sources throughout Hadza land, to swabs of grass huts, tubers, berries, food preparation areas and so on. Because the Hadza dispatch a wide range of wild animals, including a dizzying diversity of birds, we’ve amassed an impressive microbial sample of African fauna. Each sample is stored in the field in liquid nitrogen and kept frozen until it reaches labs back in states. Using next generation sequencing technology, we’ve started to characterize the microbes living on and within the Hadza and across their larger regional species pool. It is their persistent exposure to this regional microbial pool that has endowed the Hadza with an extraordinary diversity of microbes – much greater than we see among populations in the so-called developed world. Viewed through the lens of ecological theory, our less diverse gut microbiome in the west can potentially be seen as either a function of a degraded regional species pool, an increase of environmental filters that limit the immigration of microbes from the regional pool to local communities (us), or a combination of both. I would argue that much of our attention has been focused on environmental filters – or species sorting – as the primary culprit to the detriment of the equally important contribution of the regional species pool. A classic example of an environmental filter would be the overuse of antibiotics that, with each course, reduce the diversity of microbes in the host. Other filters may include that we spend too much time indoors, increased caesarean births, reduced breast feeding rates, antimicrobial soaps, skin and hair products, sub-therapeutic levels of antibiotics in livestock, and possibly even chlorinated water and various forms of modern hygiene are all, potentially limiting (filtering) nature’s time-honored immigration. Diet, modern food production, packaging and preparation – from plough-to-plate – can and surely selects for local (us) microbial communities that are greatly depleted than less filtered communities (e.g, the Hadza). But the contribution of regional species pool gets little attention in microbial research and almost no media attention – though it’s a central theme in ecology, though more focused on macro-organisms. Considering our classic environmental filtering example above, antibiotics, one wonders if someone who took an antibiotic and experienced a reduction in microbial diversity wouldn’t recover more quickly – that is, exhibit greater resilience – if they had a access to a robust and diverse regional species pool once the perturbation was released? There are hints that contact and access to a diverse regional species pools is crucial. In Finland, researchers found that lack of species richness in certain plant communities around homes effected skin bacteria that in turn were strongly associated with atopy, a common immune dysfunction of the modern world. In another study, skin bacterial communities of Red-backed salamanders showed marked decrease in richness and evenness if they were deprived of their natural, microbial-rich soil reservoir compared to salamanders housed with a soil reservoir. Currently 50% of the world’s population lives in urban areas characterized by reduced biodiversity – both at a macro- and microorganism scales. This is expected rise to 60-70% by 2050 for developed countries. Clearly today’s biosphere and the regional species pool available to colonize humans and other hosts are changing under unprecedented anthropogenic disturbances such as urbanization. No doubt a Hadza hunter-gatherer relocated to an urban city in Europe would undergo a rapid drop in microbial diversity. The question being, of course, is this a function of local environmental filters and species sorting due to things like diet and hygiene, or a degraded regional species pool that would otherwise provide new immigration to offset the extinctions created by the filters? Someone wise once said microbiome research isn’t rocket science, it’s actually harder. Decoupling the effect of environmental filters (e.g., diet, antibiotics, built environment, hygiene, birthing method) on local microbial communities (e.g., us, our homes) from the diversity and dispersal characteristics of regional species pools is a much-needed area of research. But we also must consider the possibility that our regional species pools – once teaming with microbial life with few barriers to immigration to local communities – has undergone a dramatic change in the age of human made ecological calamity – the Anthropocene. Surely better ecological management of environmental filters in developed countries at the personal and policy level would pay dividends in improving potentially beneficial microbial diversity at the individual, family and larger community level. However, armed with a better understanding that regional and global ecological degradation and disaster may be hitting a little closer to home than most of us previously imagined (our own gut), may provide a much-needed on-ramp that this generation needs to finally put the health of ecosystems – large and small – into perspective. Open-source efforts like American Gut and MapMyGut, which afford average citizens around the world access to their own microbial inhabitants through citizen science, represent a teaching moment to mobilize this much-needed group of micro-environmentalists. Previous Post Paleo versus Vegetarian – who eats more fiber? Well explained and fascinating, as always. The question that jumps off the page is this: my perception is that Westerners live longer and generally healthier lives than the Hazda. I suspect that’s a consequence of the reduced interaction with pathological microbial species or maybe even just the reduced microbial load. I’ve seen interesting arguments that the cause of the sudden jump in lifespan in the US and the West in the 1920’s and 30’s was the result of the introduction of antibiotics. While the incredible depth of the interaction the Hazda (and most likely all of humanity pre-civilization) have minute-by-minute with the microbiome both internal and external is fascinating, my guess is it is a tremendous stressor to the human system in the long term and relief from that volume of microbial interaction offers real benefits in terms of longevity and general health. Am I correct? What am I missing? 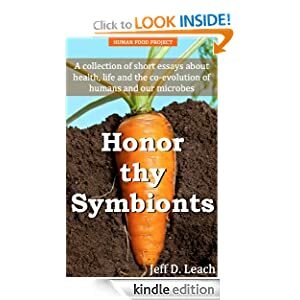 A few comments and stories – most days I go out my garden and work the land to find more/ be covered in more of my local population of microbes and therefore be healthy. That said, I have noticed that if I feed someone my chicken eggs and they were not used to a wide range of microbes that my chicken eggs cause them some gastrointestinal problems. When I was 16 and went to India and lived with folks all over Soutern Indian for six weeks both in urban and rural environments. I became really ill because I overexposed myself to either microbes or parasites that I couldn’t personally handle. This compromised the majority of my teenage years. So just exposing yourself to microbio diversity doesn’t necessarily make it good. One the other hand un-populating your microbiome can have consequences. Two years ago- due to a wide variety of stress and modern time pressures I pushed my body past health and had a urinary track infection which became a kidney infection. (I believe this was because I did not pay enough attention to the early signs of what I needed to do to help myself. Organic Chemistry and the academic calendar do not wait for you to get better.) That being said, I got very sick and was given Cipro – an extremely powerful Florine based antibiotic. It saved my life. I felt a lightening of the internal elbow pushing of the bacteria crowd for territory in my biome. Ahh- this is why people want to take antibiotics when they are sick. It lightens their personal load in the moment, and therefore leaves personal time to heal. But the consequences of not having your friendly goodie bag of bacteria around is extreme. Repopulating and remineralizing myself since has been difficult. Thank you Jeff. Understood. Your work in helping us understand that microbial web has had huge impact on me personally and on at least one little girl, my daughter, who has spent time playing in the mud and getting messy instead of remaining sterile as do so many of her friends. When the Hazda get sick what do they do, eat etc??? Do they bump up their microbes? Has your research delved into the tribe’s natural healing methodology? i. e. Medicinal plants and their specific applications. not really. outside our scope. The Antibiotics seem to have run there course in our lifetime. Are they soon going to be doing more harm than good? Hi Sean – feel free to use anything you like and any images you see on this blog as well. Thanks. Wow such fascinating work. I have been an nurse for the last 25 years. 25 years ago, caring for a resistant infection like MRSA, VRE, CRE, Cdiff. etc was a rare. For the last 17 years I have been working in the ICU. Resistant infections are common place and have a high mortality rate. I went to a lecture last year and they said the mortality of sepsis has not changed despite modern, conventional, medicine. I believe that when we bombard patients with antibiotics ‘we’ kill the village to save the king or the queen. The technology is not out there to quickly diagnose the bacteria quickly and give the appopriate antibiotic. Every one who comes into the ICU gets bombarded with broad spectrum antibiotics until the exact source of infection is identified. By the, the patient is left defenseless if they do survive the initial infection. Not that most of my patients com in with the healthiest microbiom to begin with. I hope that by the time I retire our treatment regimen in the ICU will be vastly different. I’m thinking about your comment about the “extraordinary exchange of microbes between the Hadza and their environment.” How the Hadza even eat the raw bowels of their kill. Do you think herbivorous animals are at a disadvantage since they don’t consume other animals? Or do you think humans who eat exclusively plants (even unwashed plants) are likely at a disadvantage? Not sure herbivores are at a disadvantage – as they have evolved an anatomy and set of microbes suited for their diet. not sure on the human Q. Do the Hadza smell bad to you? I’ve wondered before if people who don’t wash with soap have good skin bacteria that prevents unpleasant odors. Also the breath? You don’t brush your teeth and tongue with toothpaste out there do you? not sure on the smell – assume all of us some BO. not sure on breath. Does your work ever look more broadly at the microbiome outside of bacteria? Populations and effect of viruses, helminths, etc. on the Hadza? Your work is fascinating, really love the depth and POV of this blog. Curious as to incidence and types of parasites commonly seen in Hadza. Do they get yeast overgrowths like us? Do you they have pin worm or flukes? etc. Great Qs – we are working on that now. Stay tuned. But I know I’m still living in a vastly microbially-depleted environment, despite the diversity of my diet and avoidance of antibiotics as well as too much washing! There’s one thing I’ve heard accounted for in your account of the modern world’s condition vis a vis microbes. My understanding is that a stable ecosystem (including all life forms within it) functions pretty well, keeping all its members healthy even if it includes organisms that might be hazardous or even lethal outside that context because the creatures in that ecosystem have adapted to live together. But as soon as the early sea-going explorers plunked themselves down into “alien” environments way more suddenly than more ancient migrations might, there was no evolved immunity for the new microorganisms encountered, either by the “invaders” or the invaded ecosystem. Witness the epidemics of smallpox, etc. visited on Native Peoples when European explorers landed in the Americas. So how can we ever create a stable, mutually accommodating microbial environment when we live in a global community where people and things move across the world at lightening speeds, carrying all manner of invisible hitchhikers along to be deposited willy-nilly in places not prepared to fit them into their systems? Hi! I´ve been on paleodiet 10 years, and more and more picking wild plants in Tyresta National Park, 20 km outside Stockholm where I live. How do you think It`s influence my microbiota? What is the worm load of Hadza people. Hookworm, Whipworm, Tape and Ascaris. Also if you can shed some light on Giardia and Amoeba that will be so helpful . Hey Jeff,. I am a 35 year sufferer of autoimmunity. Your research outcome is like blessings to me. Even though I know it’s not going to change what ever has already happened to me but from a psychological point of view it’s healing. Good luck mate. Great work you’re doing! You mention and talk a lot about biodiversity, but I was curious if any studies have been done on diets consisting of only mono foods, such as the one Vilhjalmur Stefansson did when he ate nothing but meat. I’ve been reading some testimonials written by people who eat nothing but meat and drink water. They’ve been doing it for years with no apparent health consequences. They’re all saying that they have never felt better in their lives and have no desire to give it up. I wonder what their biome might look like..?! How did you change your commensal bacteria by just being in Tanzania? Martin Blaser and the Sonnenbergs reckon probiotics are adapted to the food they grew on so only act as placeholders to protect the gut from other less desirable species as they pass through (probiotics including soil-based), so what exactly (before the poo transplant) gave you a change in commensal bacteria? Were you drinking human poo contaminated water or something? It can’t have been the fibre alone, as these only increase the bacteria that are already there.